2017 Raw Fleeces SOLD! Make reservations for 2018 fleeces, all sheep wear coats and VM is almost none! If you need a referral from a customer, I will give you names! Beautiful fleeces for sure! Remaining fleeces are at Zeilinger's with my instructions for blends, 2 - Way Swirls and dyes! So exciting, stay tuned! Shearing day produces many items from raw fleeces to natural & dyed roving & curly locks! Beautiful black mohair (1st shearing), $1.75/1/4 oz. Dyed Curly Locks/Coopworth...more to come! soon - getting ready for more shows! A 15% discount is available for 1 lb. natural colors may be added as well. GO TO THE "RAW FLEECE FOR SALE" W/FACEBOOK TO VIEW MY RAW FLEECES! SOLD! Call (304-462-8043) or email: heartsofthemeadow@gmail.com for answers to your questions, you will pay the shipping. Curly Locks are available is white, tan, silver, brown and black. All are natural and the price is: $1.50/1/4 oz. This is Coopworth and is used for felting projects: hair, beards, finishing fiber/animals and so on - simply adds texture to your work! $5.00/1 oz. Beautiful dyed roving - all colors available! 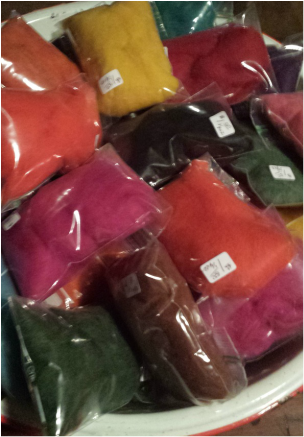 These packs of color are ready to be felted by YOU! Great to use with cookie cutters as templates (cookie cutters made in the USA)! If you are interested in a raw fleece, contact me and I will be happy to discuss the specific breed, the natural color with COOPWORTH. If you are interested in a JACOB FLEECE, most of my Jacob sheep are black w/white spots. I already have a lilac reserved for 2018! Shearing day is so exciting each year! Fleeces waiting to be skirted - picture in March, all skirted, sold and/or processed into beautiful roving for spinning, felting & weaving....by YOU!